At 34 minutes, it seemed like the balance of power had indubitably shifted towards the white of North London. 34 minutes later, it had appeared as if it had never moved. Tottenham Hotspur had taken a two goal lead and confirmed that the difference between the swashbuckle of the two sides was the end product. However Arsenal, often too ready to accept their role as beautiful martyrs and they had full right to be aggrieved when they fell behind further to a dubious penalty won by Garethe Bale, did not wallow in their adversity and responded emphatically. Everything went right for them with Arsène Wenger claiming it was a “perfect performance”. In some respects, there was nothing new about Arsenal’s performance. In fact, you might even described it as their “gung-ho” style working perfectly because while it, at times, left them exposed at the back, such as the build up for Spurs’ opener, it was the right mix of intensity and technical level. If they want to concede less goals, they’d probably have to demand an even greater share of the possession and/or compress the space quicker when they lose it. Arsenal’s rapid and intense brand of football is resource-heavy and creates undue strain at the back. But as the rest of the game foretold: if Arsenal attack like this, it is their defence. In that sense, it was strange to see Tottenham cut off so much of their attacking threat in the second-half as while they probably did the right thing, congesting the middle of the pitch by moving to a 4-5-1/4-3-2-1 with Gareth Bale and Rafael van der Vaart roaming, it narrowed the space for their key player – Bale, who was superb in the first-half – to cause damage. (And it was even more strange to see him shunted to the right for the majority of the second-half; it was probably a case of Harry Redknapp looking to get more of their best player by giving him freedom but he sacrificed the rest of the team to try and squeeze more out of one). 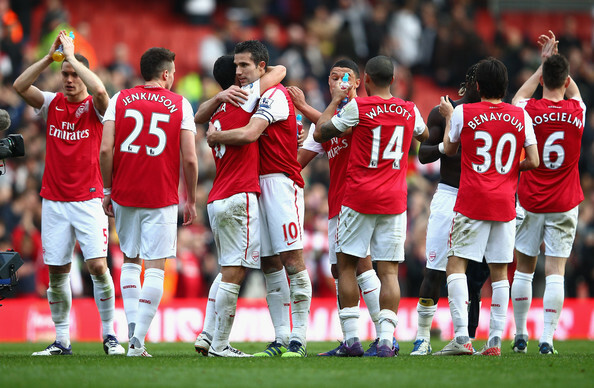 Arsenal were excellent – pulsating at times. Robin van Persie led by example and he confirmed his status as the most hard-working player in the league with another tireless shift (he runs on average 6.148 miles a game). He dragged Arsenal to their feet when on another day it might have dropped. Certainly, there was a noticeable shift in Arsenal’s mentality while Alex Song could be seen geeing his team up when they fell behind on four minutes. The midfield swirled and snarled at Tottenham’s attackers to try and win the ball back and then kept the ball brilliantly to sustain the pressure. And while Mikel Arteta probed and prompted, Tomáš Rosický gave a direction to Arsenal’s attacks and his goal to put Arsenal in the lead, epitomised their philosophy. As Theo Walcott played the ball into the box following a furious counter-attack, The Gunners had four men waiting to receive the pass. Talk of “philosophy” implicitly imbues it with a kind of moral superiority that tends to irritate but this performance gave it back to Arsenal when it had seemed as if it had deserted them this season. The selection of Yossi Benayoun epitomised that, signalling Arsenal’s intention and their ideologue for the match. He wasn’t starting by default just because Andrey Arshavin had left. No, this is a player who has finally got his chance – his deserved chance. In his short period at Arsenal, Benayoun has shown a willingness for the fight and a refreshing patience to wait for his opportunity. He scored a header in the last minutes against Aston Villa and the reaction of his team-mates said it all; they were wishing it on him to score. Add to that he was thrown in in not too favourable conditions away to Borussia Dortmund (and Swansea City), in the unfamiliar position of central midfield and was tasked with taking a creative mantle in the Carling Cup. It’s just a shame in the past few seasons, his talent has never been rewarded with starting spots. At Liverpool, he had an in-out relationship with Rafael Benitez while Andre Villas-Boas wasn’t willing to take the punt with him, in either the wide striker roles or in the centre in his 4-3-3. It’s a similar scenario at Arsenal where, if he had come in another season where the ideological slant hadn’t shifted slightly away from the intricate towards the direct, then he surely would have played more often. With Arsenal suffering in past derbies from a lack of control, Wenger got it correct tactically by playing the Israeli midfielder. 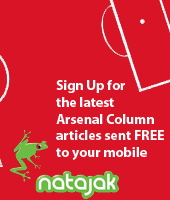 With Benayoun frequently involved in the build up, Arsenal refound their control and swagger. No longer did Robin van Persie remain exclusive to a poacher’s role; he roamed around the pitch, dropped off his marker and was allowed to spontaneous again. His goal to equaliser was the perfect expression of his new-found freedom as he curled the ball into the corner from the edge of the box. And Wenger knew, with Benayoun’s presence as a half-winger on the other side, it would eventually see Theo Walcott come good. Indeed, Arsenal’s set up changed slightly in the second-half with Benayoun tucking in and Alex Song dropping deeper thus allowing Walcott to push up; it’s something they have experimented during Thierry Henry’s brief spell at the club. But with Spurs playing more narrow, it allowed Theo Walcott to get behind constantly and Arsenal’s formation flitted in and out of their 4-3-3 to a slanted 4-4-2. Walcott profited and punished in a match where, not only did Arsenal wrestle back the balance of power back to red and white of North London, but they also rediscovered their identity. 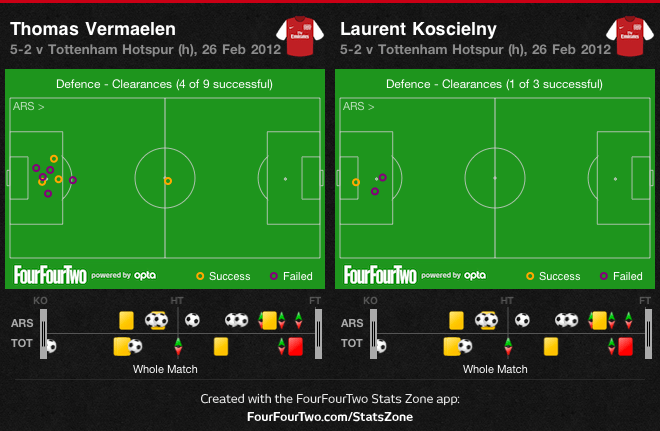 Arsenal 5-2 Tottenham Hotspur: Saha 4, Adebayor (pen) 34, Sagna 40, van Persie 43, Rosicky 51, Walcott 65, Walcott 68. If Arsenal played with a spirit and desire to get the ball back quickly, it can be showen by the graphic for their interceptions. The ball was rarely won in their defensive third but in the middle third of the pitch. Arsenal began with a fervour and while the lack of interceptions in defence might show how well Tottenham stretched play in the early periods – Arsenal 11 of those interceptions in the first-half alone – it also showed Arsenal’s determination to compress space and play up the pitch. Perhaps Arsenal were a bit nervous at the start abecause once they gained their composure, they were imperious and could sit back and soak Tottenham’s meek pressure. (As ever, click to enlarge). The return of two natural full-backs saw the return of Arsenal’s right-side bias with 42% of attacks stemming from that side (the average has been 36% down the right and 31% down the left). This means the two full-backs play slightly differently. Bacary Sagna plays a supporting role, always looking to make himself available in possession while Kieran Gibbs is generally more reserved; his forays forward are often more selective (he was involved in the build up for the first, coming forward late). Wenger admitted he was thinking about taking Theo Walcott off at half-time but decided against it; the momentum was with Arsenal and that increased the likelihood, especially as Spurs might have to push forward now, to release him. It happened – three times in fact – all in the second-half and of course, he got the two goals (and had a 100% pass accuracy too). 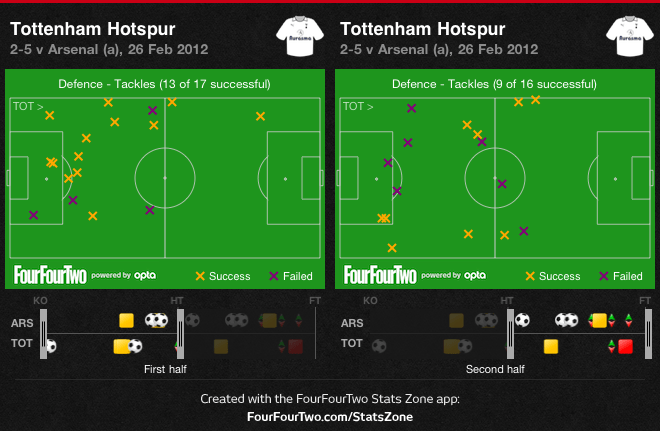 And while Tottenham nullified Walcott in the first-half as shown by the tackles on the right, the change of shape in both sides meant that it happened less in the second. 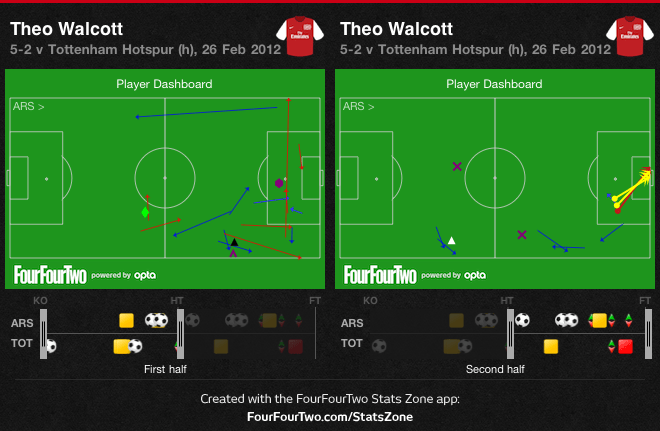 Theo Walcott got behind easily as the Spurs formation narrowed. Thomas Vermaelen had a difficult opening period. He was constantly sucked out of position as his impetuousness can often leave him exposed. Too often, he tried to attack the ball too early and Spurs got away on a couple of occasions (although Laurent Koscielny was also guilty of that for the first goal). Vermaelen has played much of his recent games at left-back so over-zealous approach will need time to curb. Nevertheless, he showed that he has the all-round ability to replace Per Mertesacker – who was beginning to come into his own before his injury – as he completed the most clearances for Arsenal – ground and aerial (3/5 headed clearances and 4/4 aerial duels won). It’s argued Alex Song’s forward runs can sometimes be detrimental to the team balance but that’s untrue because it’s usually selective when he gets up the pitch. This can be shown by the assist he made for Arsenal’s fifth but in the second-half, he almost completely reigned his attacking instincts and just sat in front of the back four – often very deep – to allow the other midfielders to play. He was probably the most underrated of the six attacking players yesterday but just as pivotal.